I am going to share with you something that is very simple, relatively easy to do, that will double or triple the amount of energy you feel you have every day. It will most likely also double or triple the amount of success you experience…what is this amazing secret? It is SO simple, and most people rarely take advantage of it – and that is simply choosing everything you do throughout the day, 100%! Our alarm goes off and we don’t feel like getting out of bed, and we force ourselves to get up. When we tell ourselves we SHOULD do something and we don’t want to. When we have a dinner (or party or social function) and we would rather stay home, but we go because others are expecting us to be there. When we do the laundry and housework and feel resentful that others are not helping out. When we are at work and feel resentful because someone else is not pulling their weight. Another common way we generate ‘Split Energy’ is when we make a decision and then ‘second guess’ the choice we made – whether it is something as simple as what we decide to order at a restaurant (“I should have ordered the cheeseburger, rather than the salad…”), or something very significant such as who we marry or what job to take. When we make a decision, we need to choose it 100%! Worry is a more subtle way to split our energy: when we think “I want this to work out,” we are heading in one direction, then, “What if it doesn’t work?” we are going in the opposite direction! There is a phrase I use a lot: “Energy flows where our attention goes.” So, it follows that when we choose something with ANY reservations, we have placed ourselves in an energy tug-of-war! 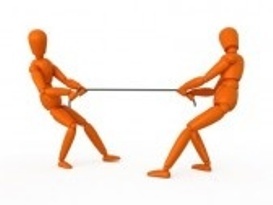 This energy tug-of-war is what makes us less effective, fatigued, and generally feeling anxious. Just imagine how much energy you can free up if you put all your focus in the same direction! That isn’t necessarily true. If we recognize how self-defeating it is to do anything with split energy, we can choose to do things without any resistance! It is the resistance that drains us! Imagine something that you often do reluctantly (i.e. with split energy). What if you were to take a moment and decide to “Do or Don’t Do” – Many times, the consequence of not doing something feels worse than doing it (such as not going to work that day) and so we force ourselves to do it. What if we took no action, until we chose it 100%? What if we talked ourselves into fully embracing the task at hand, whether it is washing dishes or writing a report? I know from my own experience, that by simply choosing something 100%, I feel a HUGE increase in energy and end up feeling really great! There are times also, when I decide it feels better to NOT do something, and I feel great relief! Just Do It – 100% and see how much more energy you feel each day.